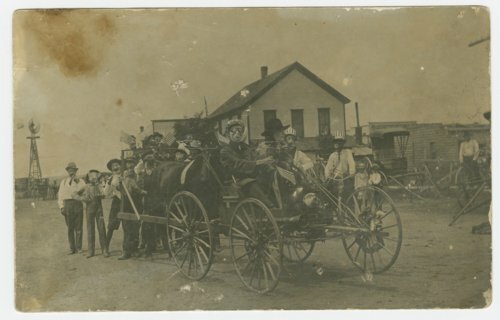 This is a postcard showing a vehicle being pushed by horses participating in an unidentified celebration in Waldron, Kansas. A number of the men are wearing clown type masks. Some are blowing small horns and two are wearing flag striped top hats. There are also a number of small U. S. flags. The white building in the background is a hotel. There is also a windmill in the photograph.